Her rebellious streak attracts the attention of local golden boy Doyle Rahn, who teaches Nes the ropes at Ebenezer. As her friendship with Doyle sizzles into something more, Nes discovers the town she’s learning to like has an insidious undercurrent of racism. The color of her skin was never something she thought about in Brooklyn, but after a frightening traffic stop on an isolated road, Nes starts to see signs everywhere – including at her own high school where, she learns, they hold proms. Two of them. One black, one white. I don’t think you all even know how difficult it was to write this review. There was just so much I wanted to rant about that I didn’t know where to start, what to include, what to leave out (for the sake of length), and gosh, this was just difficult. If this book was two and a half pages, it would still be too long for all of the irrelevant and unnecessary discourse that Reinhardt put in Rebel Like Us. This is going to be a doozy everyone, protect your books, I’m about to rip some pages. I don’t like the beginning dialogue where the students are asking Agnes if she moved because her “hood” was too violent. I don’t like how Reinhardt has one of the (black) characters, Alonzo, speak like this: “My daddy done told me…” I should hope I don’t have to explain why I have an issue with this. I don’t like how instead of just saying a character was black, she was described as having a “Nefertiti/Beyoncé” vibe. I don’t really like Agnes. She came off as judgemental and rude within the first few pages. When a guy she just met about twenty minutes ago says his brother is a marine, she asks, “Does he have PTSD?” But of course, she justifies this invasive and inappropriate question by saying she hopes she isn’t overstepping. What the heck? You don’t ask someone that. Another example? Her dialogue with her mom. Yeah, her mom really messed up. Yeah, her mom is (spoiler) a homewrecker, of not one, but technically two homes. And yeah, Agnes is (rightfully) upset. But Agnes takes it too far. She is malicious towards her mother. Agnes goes out of her way to absolutely trash her mother to her face, with vicious comments and awful biting replies. Even when her mother begs her (while crying!) to stop punishing her because “[she] mess[es] up too,” Agnes chooses to reply with a sarcastic little speech. Her excuse as to why? She wants her mom to respond angrily so that it’ll return to “old times”. I don’t like that Reinhardt used the “blonde villain” trope. When two girls behind Agnes start giggling about her name , she says they’re “generically pathetic” and “wouldn’t even have names in the credits” if life was a movie. She calls them the “Generic Mean Girl Twins,” “twit twins,” and “plastic airheads” and judges anyone who hangs around them. Now, I’m not saying those girls weren’t rude for making fun of Agnes’ name, but Agnes’ reaction just didn’t sit well with me. It’s a common cliche where there’s always a girl or multiple girls that are “queen bee(s)” and the main female character hates them immediately. Of course, they’re blonde or “flaxen haired” and one is described as a “harpie”. It goes on throughout the entire book. There’s a blonde girl named Ansley. Before Agnes came along, everyone either tolerated or liked her, but once Agnes showed up, everyone suddenly hates her guts. Out of nowhere, people are saying Ansley is “the prototype for a fairy-tale villain” and thinking “What did [love interest] I ever see in her?” There’s a heavy amount of comparison between Ansley and Agnes, effectively pitting them against each other and that’s not fair. But honestly truly? All of these issues are minor. Who cares? The real and serious problem is this: The synopsis is misleading and sets you up for a major let down. The color of Agnes’ skin was not really as big of a deal as the synopsis wants you to think. There were bits and pieces of racism throughout the book, but nothing that went as in-depth as I wanted it to be. I thought this book was going to supply a close look at what racism is, from a person of color’s (POC) perspective. It supplied a look, but it was like standing on top of the Eiffel Tower and looking at someone on the ground through binoculars. Yeah you’ll see them, but really, how well can you see them? I firmly believe that if you’re going to write an entire paragraph about how racism impacts your main character in the synopsis, it should actually truly impact your character. I didn’t read Rebels Like Us to see blatant racism like a segregated prom, that’s way too easy. Is it possible? Well, maybe. But it’s a lot easier to throw in a segregated prom to show racism than it is to show racism in the undertones of people’s voices, in the seemingly kind phrases (“You speak so well!”), and in the way someone looks at you when you introduce yourself. Also, considering Agnes is supposed to be dark skinned, I find it completely unbelievable that she hadn’t experienced racism before she came to Georgia. There’s almost no way that all of the time she spent in New York, where she admits has “tons of racists too” that she never experienced first-hand racism. Come on. I also hate the fact that the love interest gives all of these excuses as to why everyone is racist. Or that he didn’t have a reason to speak out against racism before, but now that he’s in “love” with Agnes, he does have a reason! Whoo hoo! Context: Agnes is upset that proms are segregated and asks why no one has stood up to the people in charge about it. Oh okay cool! I guess that makes it okay! Context: Agnes is making excuses for all of Georgia’s racism because “that’s what things are like down here”. Really now, love interest? Because you didn’t say a word about it before and seemed to be doing just fine. So I have to ask, what changed? Is it because you tangled with Agnes and you need to prove you aren’t passive about racism in order to keep her around? I’m just so disappointed in this book. I really thought Reinhardt was going to deliver an interesting and well-thought out book that was based on realistic scenarios and solid research that I could agree with as another POC, but she didn’t. Instead, she wrote Rebels Like Us. Would You Recommend Rebels Like Us? I would not. At all. 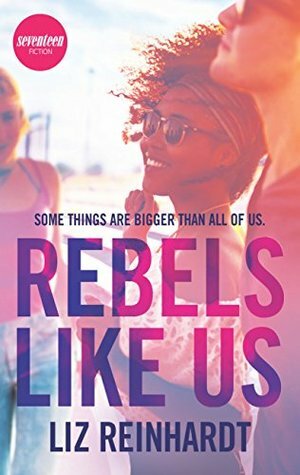 I received this book from the publisher, Harlequin Teen, for free via NetGalley in exchange for an honest and unbiased review.